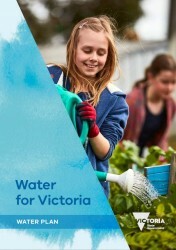 On Wednesday 19 October, the Victorian Government launched the new State Water Plan. The comprehensive state-wide water plan provides a new framework to guide integrated water management (IWM) and explore alternative water sources – including recycled water and stormwater – to create more liveable and resilient communities, amongst other objectives. At the launch of the plan, Minister for Water, Lisa Neville, emphasised improved planning and building regulations for better water outcomes and a push for Victoria to provide international leadership in demonstrating how IWM can improve urban and regional liveability. Minister Neville said the Water for Victoria plan was "innovative, future-focused and affordable". Specifically, in relation to innovation, she mentioned the importance of designing liveable and resilient suburbs of the future; putting IWM into practice; local decision-making; reviewing Victorian Planning Provisions (Clause 56.07) and building regulations to improve stormwater management outcomes. Water for Victoria outlines a plan for deeper engagement with the community including Aboriginal Victorians and a series of community forums to explore IWM opportunities. Check out the official media release.